I had a physio session with Tom this week and whilst he was applying extreme pain into my tight calves he asked if I wanted to write something for his web page, well I had a think about it and as with most runners there is a story, it’s a tale of inspiration, running injury, re-assessing goals and never ever being too old to run. I only discovered distance running at the age of 48, It was the 2012 Olympics and particularly Mo Farah & Jessica Ennis that inspired me to do something sporty, so I signed up for the Brighton Half Marathon, my first ever running event! Up to this point I had tried to maintain some sort of fitness with a 2.5 mile run at the weekend! Well as quite often happens from what I understand, I loved every moment of the race and found I was hooked on running and couldn’t wait to do another one. Now with the running bug I took part in 26 races in 2013 and it has become quite a significant part of my life, it has had a massive effect on my health and fitness, I think I am fitter now at 50 than I have ever been. During 2013 I completed eight half marathons achieving a PB of just under 1 hr 32 mins in September so I set myself a goal, to run a sub 1 hr 30 at the Brighton Half Marathon in Feb 2014. All was going well until Christmas. During my runs I was starting to get a niggle in my right knee, stairs would cause a bit of pain and driving was aggravating it. I’m not sure what triggered the problem, I did get new running shoes just before Christmas but had the proper gait testing done. Also I had quite a busy running schedule in the latter part of 2013, so it may just have been overuse. The pain I assumed to be ‘runners knee’ having read various articles on the internet. During the first two weeks of the New Year it gradually got worse, I tried cutting back on the running and didn’t run for a 5 day period, which was extremely unusual, I was hoping it would just right itself, it didn’t. It all came to head when I went for a run mid-January. I set off for a mid-week 6 mile run but as soon as I started the knee was hurting. I was still recuperating from a cold I’d had the previous week so wasn’t feeling particularly good anyway, but with the pain in the knee as well it all just become intolerable and I had to stop running after 5 miles. This was a first, I had never stopped during a run before, this was serious and I had to get it sorted, I had a goal to achieve in a month!!!! When I got home I googled physios in Brighton and I discovered The Physio Rooms, I made an appointment with Tom, and that started my rehabilitation. I obviously wanted to keep running to compete in the Brighton Half and Tom being a runner was very sympathetic to this, I did stay running albeit not so intensely as before Christmas. As far as the goal was concerned, this was now put on hold, it would be my anniversary race and I just wanted to take part and enjoy it, it is a great Half Marathon. I decided to take part in the Chichester 10K the week before the Brighton Half as a bit of a tester to see how the knee would hold up. It wasn’t a good run, the knee was niggly for the whole race, and afterwards walking to the car was really strange. The knee seemed to have forgotten how to work properly, and driving home it was very painful, so it wasn’t looking good. A few days before the race I had a session with Tom, he taped me up and wished me luck. I don’t know exactly how it happened but I had an absolutely fantastic race, the knee was niggly and stiff for the first few miles but my mile splits were looking really good. The sun was shining, the crowds were cheering and I came in at 1 hr 30 mins 35 secs, just a massive reminder of why I love to run! It was a PB, so I am one of Tom’s PB’ers, goal not achieved but pretty close and I’m sure it’s just a matter of time once the knee is better. After the race the knee was pretty stiff for the rest of the day and walking was tricky, but all worth it. It’s now mid-April and thanks to Tom I’m still running and the knee is continually improving, it’s being managed. I’ve competed in another three Half Marathons since Brighton, I turned 50 in March and the Hastings Half Marathon was going to be my first V50 race, so it was really important to me. I had a really good run and finished 237th overall, and 14th in my new age category! I’ve stepped the running down a gear at the moment, which will hopefully help with the rehabilitation but it is a bit frustrating. I particularly love doing the parkrun on a Saturday morning but have found that it can aggravate the knee as I always look to run it for a PB, so it’s a pretty intensive 5K. This has caused me problems for my Sunday run so I have to keep it as an occasional run at the moment, it’s going to take me years to get my 50 Runs T-shirt! Parkrun is such a brilliant concept, hundreds of people of all ages and all abilities turn up at Preston Park & Hove Park on a Saturday morning come rain or shine to run, and this happens all over the country, just amazing. As the knee continues to improve I am hoping I might be ready to undertake a Marathon in 2015, it’s nearly made the goal list, but I’m still a bit tentative at the moment. 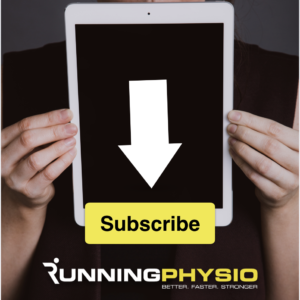 So runners, especially those that have suffered with the dreaded ‘runners knee’ hope you can relate to the story, and to all runners make sure you get professional help if you have an injury, it doesn’t necessarily mean your running days are over. Get advice from an experienced physio/ health professional to determine what the injury is and ensure it’s safe to continue running. Modify training to bring it to a level that doesn’t aggravate symptoms during or after exercise (see pic below for guidance). Calm the pain with tape, ice, heat, massage, taping or whatever works for you. Identify the cause of the problem (training error, muscle weakness etc.) and address it. Rehab with strength and conditioning work from your physio and make sure you do it! Develop some strategies to reduce pain when running (e.g. Changing stride length, slowing down etc.) practice these in training to see what works. Taper well before each race – generally less is more when managing an injury, give it some time to settle before and after race day. And finally…plan long term not just for the next race. Discuss with your physio how you can fully rehab the issue. This might mean a reduction in running and gradual build up when races have finished. Unfortunately there can be a downside to competing with an injury – it may take longer to recover. This depends on the severity and nature of the problem. Be guided by your physio and remember your long term as well as short term goals. As ever with advice from RunningPhysio if in doubt, get checked out! Thanks Dean for sharing the pain, and congratulation for your determination and excellent times. I am in a very similar situation. I have been training for my first full marathon since January 2014. In November 2013 I ran my first half marathon and both preparation and the race went well with no probem at all. In January 2014 I increased the work load by quite a bit by running up to 40 miles a week to make ground for the marathon in May. In conjunction with that, I started to run constantly on the pavement (as before I was doing a lot of off road too) and I bought new shoes. As a results I started feeling a pain in my knee which increased quite rapidly till the point when I had to stop. Now I am doing a lot of cross training in the gym to keep fit but when I run once a week the pain is still there and I can’t even complete 10km anymore. I am seeing two physios, one told me that I have patello femoral pain, the other one says patello tendinitis. I am doing exercises, icing the knee after work out, taping it. I also bought new barefoot running shoes and tried acupuncture and ultrasounds. But when I run the pain comes back and after 6-7 km it becomes quite bad that I stop because I don’t want to cause further damage. So frustrating I have little option now but withdraw from my first marathon. I would love to throw my self into the race like Dean did and “see how it goes” but with full marathon it feels too much of a risk. and honestly I don’t think I would have any chance to complete it. I was going to ask, are these patello femoral pain or patello tendinitis pain curable? How long does it normally take?